I have an interview on BlogTalkRadio on Saturday, September 5 at 11:30am ET. We’re going to be talking about back story -- where I got the ideas for A Spark of Heavenly Fire and More Deaths Than One. Although one of the hosts of the show has read at least one of my books, I’m sure at some point he will ask me, “What are your books about?” And I will give the same answer I give to everyone who asks. A blank stare. Though, being radio, it will come across as blank silence. How does one encapsulate a three hundred-word novel with subplots and subtexts, themes and scenes, complexities and ironies into a minute of description? This distillation is commonly called an elevator speech, and after five months of being published, I still haven’t figured mine out. I can talk around the story -- More Deaths Than One is a thriller/mystery/suspense novel that explores what it is that makes us who we are. Is it our memories? Our experiences? Our natures? A Spark of Heavenly Fire is a thriller/suspense novel with a strong romantic element. It tells the story of ordinary people who become extraordinary because of the trauma they must endure. -- But neither of those descriptions gives an idea of what the stories are about. I can relate a bit of the story -- More Deaths Than One tells the story of Bob Stark who sees his mother’s obituary in the morning paper, which stuns him because he buried her two decades ago before he the country to live in Southeast Asia. So how can she be dead again? A Spark of Heavenly Fire tells the story of how Kate Cummings, an ordinary woman, gathered her courage and strength to survive the horror of a bioengineered disease let loose on the state of Colorado. This summer, I’ve been editing the first book in my new mystery series. This is draft number ten, but I have good reasons for tackling it again. First, the training I received for my current work in security has offered some deeper insights into policy and procedure changes for people working in this field. Since my protagonist is a transit security cop, it was important for me to update the way she handles certain situations. Secondly, the manuscript is currently being considered by a publisher who generally publishes mysteries about 10,000 words shorter than mine. You see, no matter how finished you think you are with your manuscript, there’s always another draft down the road until the book is finally published. The good news is that I’ve been able to cut over 3,000 words so far. This is a bit surprising because when I submitted that book originally, I was convinced that it was as polished and tight as it could be. A year later, it’s quite clear I was wrong, but it’s also a good thing that so much time has passed because I might not have seen these things if I’d only taken a few weeks. I’m not sure how writers under contract to produce a book every year do it. Maybe they get it right the first or second time, or maybe they’re very lucky and have a great editor to help them peel away the extra layers. The other thing I want to talk about is my guest spot on a terrific blog called Park Avenue Princess. The blog owner invited me to write a little about myself, and she’ll be posting a review. Four out of five tiaras, no less!! She's also offering a giveaway of Fatal Encryption which I believe goes on until September 17th. If you’re interested in winning a copy of my book, please visit http://tinyurl.com/p5zfpb. Thank you! I love starting a new blog, though technically, my latest blog is not a new one. I set it up Wayword Wind at the end of last summer because I wanted a green blog to go along with my blue one (Bertram's Blog -- writing), my purple one (Book Marketing Floozy -- promotion), my red one (Pat Bertram Introduces -- character interviews), and my orange and yellow one (Dragon My Feet -- books and reviews). I never quite knew what to do with the lovely green blog because it seemed as if the others already deal with the topics I'm interested in, but it's been sitting there taunting me all these months. At one time I thought of posting quotes and then giving a commentary, but I really don’t have much to say on any subject except writing. I discovered this recently when I started yet another blog simply because I like the WordPress theme. (Do you see a pattern here?) I call it The Mind of Pat Bertram, but since I seldom post to it, you can see how little is actually on my mind. Then I thought of turning Wayword Wind into a blog for posting my progress with Julia Cameron’s The Artist’s Way program, but since I haven’t actually been doing the program, there's really nothing to say about it. Then I realized I have several photo essays that I've posted on various sites, so I brought them all together under one roof. And green is the perfect color to set off the pictures. So, now I have all my blogs organized. Now I just need to figure out how to organize my time so I can post to all of them! Actually, you can help. If you'd like to do a character interview, you can find the questionnaire here: Character Questionnaire. If you have book information, a book review, or anything bookish that you'd like me to post on Dragon My Feet, or if you have an article about book marketing, leave me a message in the comment section. I'll be glad to have you as a guest! 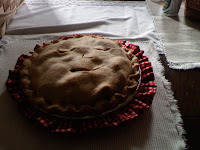 I have been making apple pies since the seventies, perfecting the crust, the texture, the apples and the taste…tart. My pies have been a staple in our building of traditions, one pillar among many. We are a family of foodies and there are occasions that require apple pie. Twenty years ago, Pat Brooks (New York Times) praised the crust (like grandma used to make) and its taste. That was in the days when you could bring baked goods to local establishments and “sell” them with out worries of the health department or salmonella. This weekend I entered my green apple pie in a local agricultural fair, one that brings their blue ribbon apple pies to the state fair. I entered without expectation, just for the fun of it. I had long ago ceased to “sell” my goods and now baked only for those whom I loved. Interview on Thursday…”Meet the Author” http://wxci.org 91.7 FM on your radio at 9:30 am and again on Sunday the 30th at 9:30 am. You can stream the broadcast on your computer. When my first mystery, Taxed to Death, was published I was proud, but even more than that, I was relieved to have finally seen this book come to light. It had taken me years to write it and, as my mom said, “only three days to read”. My second mystery, Fatal Encryption, took almost as many years to write, although I have to say that with both books, I was also working on short stories, personal essays, and writing-related articles. After all these years, I’m still not a prolific author. I wish I was, but I’m not. Below is the reason why. Can any of you relate? On Friday, my day off from work, I had contractors working in our backyard, the furnace maintenance guy show up, school supply shopping, the kids’ passport photos done, chores, laundry, and a trip to the movies to see the latest Harry Potter installment. In between, I squeezed in some editing and reading. Saturday was a Curves workout, a trip to the grocery store for last minute things for my mom’s BBQ later that day, plus dim sum with my hubby’s family mid-morning. Oh yes, there were bathrooms to clean too. Between each event, came a little more editing, social networking and about 15 minutes of reading at the end of the day before I crashed, exhausted. Today—Sunday—I was up at 5:30 a.m. for work, where I squeezed in 10 minutes of reading before dashing out the door. I grabbed a chapter to take with me and spent a few minutes of editing on my first break. People were in the staff room on my second break, so I read for twenty minutes instead. Now I’m home and I have a little energy left. Notice that I haven’t done any cooking these past three days? That’s mainly thanks to my son who loves to cook and has plenty of time before he heads back to school. In the last three days, I’ve spent all of three hours of editing and another two hours of networking or other writing-related activities. I was a big fan of James Clavell, but did you know that he had a researcher and a secretary to type his work? Many other famous authors have had this kind of help too. One reason for their output and consequent fame might be that they didn’t spend their time cleaning bathrooms, grocery shopping, doing laundry, and school supply shopping with their kids. And let’s not forget the day job. My hat’s off to any writer who’s balancing jobs, with kids, with housekeeping, and still managing to write novels. If you’re doing all that and still producing a novel every two or three years, than you deserve a medal, made of solid gold, although I’m sure you’d prefer the publishing contracts. So, stop by and join the celebration! What Second Wind Book Do You Wish to Read? You Might Get Your Wish! Introducing the authors of Second Wind! I also got reacquainted with a nephew who is studying visual arts, and we decided to collaborate on a graphic novel. I’ll do the writing, he’ll do the art. He doesn’t want me to research how to write a graphic novel because he says that way I’ll write something totally new and redefine the genre. We’ll see. Should be interesting since I’ve never even seen a graphic novel. So now I have two writing projects that I’m not working on -- this graphic novel and my poor moribun WIP. One of these days I’ll get busy. I promise. A few weeks ago, I wrote about a couple of Americans who were petitioning the court for permission to burn a book because of its anti-Christian and apparently vulgar content. There’s no doubt in my mind that some of our Canadian readers shook their heads in disgust and might have even thought, “well, that wouldn’t happen in Canada”. Maybe it would, maybe it wouldn’t, I don’t know. But, according to an article in The Toronto Star, the American classic To Kill a Mockingbird is being pulled from the Grade 10 English curriculum at St. Edmund Campion Secondary School in Brampton, Ontario this fall because one parent complained about the use of a racial slur in the book. Of course, everyone is entitled to their opinion, and I’m not dismissing the parent’s concern. As a parent of school age children, though, it bothers me that one person’s views can apparently dictate changes in the curriculum without bothering to consult other parents. You see, my American friends, Canadian governments and other institutions have taken political correctness a tad too far over the past twenty years. In fact, it sometimes reaches new levels of absurdity. If I was a parent at that school, I’d be furious with the school for banning something based on one complaint. What would they do if twenty parents complained just as loudly and vehemently about To Kill a Mockingbird not being on the curriculum? Maybe they should. I find it sad that the complaining parent has clearly missed the point of To Kill a Mockingbird’s message. Perhaps this person hasn’t even read the book. Racial slurs, racism, ignorance, hatred, and bigotry are exactly what the book’s about. As many of you know, Harper Lee wasn’t glorifying these things—she was exposing them for the horrific entities they were and still are. She revealed suffering and the social climate as it was in the south back then. She showed people as they really behaved, what they really thought, and how they were really treated. In a way, the book’s a barometer that measures how far we’ve come since To Kill a Mockingbird was first published. Demands to ban, or even burn the book, show us just how far we still have to go. Well, it finally happened. I’d been holding out as long as I could. After all, there were concerns about privacy and wasted time and navigating my way through one of the largest social networking sites ever created, but I finally did it. With the help of my savvy daughter, I joined Facebook a few days ago, and I think it’s going pretty well so far. My decision to join was inspired by a panel of well known writers, including Dana Stabenow and Laurie King who said that Facebook was a great way to promote oneself and one’s work. They’re also big fans of Twitter, by the way, which I’m also on. I don’t know if unknown writers like me successfully promote on Facebook, but I do know that I now have fifty-five friends and belong to three groups, which I have visited only once. I’m still trying to learn all the things one can do on the site and figure out the most efficient way to use it. This could take some time because, frankly, Facebook’s a little overwhelming, although friendly. If any of you are already on Facebook, new friends are always welcome. Our own Cheryl and Pat have found me, and Pat’s been a great help. If anyone has suggestions about how best to use Facebook, I’d love to hear from you. See you on the Home page. CKT: I understand you teach a Family Legacy Workshop at libraries. What is family legacy? Linda: It’s important to teach our children their heritage. Who are your ancestors? What were their traditions? Did they fight for a cause and what was it about? Each of us has a story from our ancestors or even our own story to tell. If these stories are unwritten, then how are your children going to know of their parentage? It’s up to us to write these experiences down. Turn your family history into a variety of interesting stories, something your children will be proud of. For a sample of what you can do with your family histories, read the short stories on my website http://www.lindaweaverclarke.com/. I became interested in teaching this Workshop because of my own experiences with writing my ancestors’ stories. As I put their lives down on paper, I felt close to them. It was an awesome feeling. When I teach my classes, I tell my audience that it’s like Leon Garfield said, "The historian, if honest, gives us a photograph; the storyteller gives us a painting." I teach people how to paint, how to tell their stories. Another woman from Cholla Library in Phoenix, Arizona said something that really surprised me and touched my heart at the same time. She said, “I’m a professor at the university and have attended many writing classes. I just want you to know that I learned more at this 2-hour workshop than any class I’ve attended. Thank you.” I was so touched by what she said. CKT: What is your new book David and the Bear Lake Monster about? Linda: Deep-rooted legends, long family traditions, and a few mysterious events! Once again the Roberts family is reunited with David trying to solve personal issues and overcome his troubles! David quickly becomes one with the town and its folk and finds himself entranced with one very special lady and ends up defending her honor several times. She isn’t like the average woman. Sarah is different. This beautiful and dainty woman has a disability that no one seems to notice. He finds out that Sarah has gone through more trials than the average person. She teaches him the importance of not dwelling on the past and how to love life. After a few teases, tricks, and mischievous deeds, David begins to overcome his troubles, but will it be too late? Will he lose the one woman he adores? And how about the Bear Lake Monster? Does it really exist? To read an excerpt, visit http://www.lindaweaverclarke.com/samplechapters.html and click on the title. Linda Weaver Clarke is the author of Melinda and the Wild West, a semi-finalist for the “Reviewers Choice Award 2007.” You can learn more about her by visiting her Blog Spot at http://lindaweaverclarke.blogspot.com/. For me, one of the most appealing aspects about novel writing is developing a plot and writing that first draft. I’m one of those who likes to take a pen and paper, or pencil as the case may be, and just go with the flow. Sure, I look at my outline occasionally, but outlines are merely guidelines; something to be changed and improved upon. Once that first draft is finished, I spend a great deal of time editing. I’m constantly rewriting, cutting, and smoothing out the rough bits. The process is slow and usually takes eight or nine drafts over a long period of time. Sometimes it’s disheartening to realize that only a small percentage of my writing time is spent creating new work. But it sure is terrific when a contract comes through and that cheque comes in the mail, or through PayPal these days. This past month was a rare treat for me. I plotted a new mystery (the fourth in a series I’m working on) and started writing the first chapter. As things turned out, though, I also heard from a publisher who’s interested in the first book in the series which I submitted over a year ago. She’s offered some helpful comments, so once again I’ve pulled out that manuscript. It’s been so long since I finished editing that book, it almost feels like a new work again, which could be why I’m enjoying the editing process so much right now. Meanwhile, the new novel now sits on the backburner, simmering away, patiently waiting and, honestly, I can’t wait to get to it either. That’s one of the many thing I love about writing. Perpetual optimism. All too often inexperienced writers tiptoe through their novels, letting major events -- fistfights, gunplay, murders, betrayals -- take place off-page. It's much easier to let characters emote afterward than for the writer to take the time and trouble to tackle the action scene. I know I have passed on opportunities to create such scenes, thinking the characters' reactions all-important, but I forgot one thing: readers need to experience the drama. Sometimes it's hard to find the confidence to bring such complex scenes to life, to juggle the many elements that comprise an action scene, but the only way to learn is to plunge headfirst into action. Write it fast and fearlessly; let the words fall where they may. You can always clean up the mess in rewrites, so there is no reason to hold back. By jumping into situations that test your characters and your writing ability, you can give your stories drama that stands apart from the common. Writing is an adventure and we need to boldly go where our story takes us. Goethe wrote, “What you can do, or dream you can, begin it; boldness has genius, power and magic in it.”I’ve dreamed my new novel. Now it’s time for me to begin writing it. Perhaps this bold step will bring, if not genius and power, then magic.